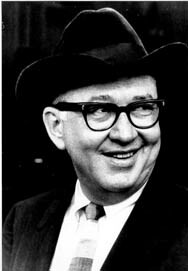 Robert C. McDowell, a native of Simpsonville, Kentucky, received his Bachelor of Science in civil engineering from the University of Kentucky in 1935 and a Civil Engineer degree in 1943. In 1962, he was awarded an honorary doctorate from the University of Kentucky. Mr. McDowell founded several construction firms in the United States, Canada and Venezuela for which he served as president and chairman. He was head of RCM Engineering Company in Bath, Ohio. At the time of his death, he was a member of numerous state and national professional societies, served on several University committees including the University of Kentucky Development Council and the Executive Committee of the Kentucky Research Foundation, and was actively involved in civic organizations. Mr. McDowell was a Fellow of the University of Kentucky and recipient of a number of awards and honors. Among those were the UK Centennial Medallion (1965), UK Hall of Distinguished Alumni (1965), University of Michigan Tau Beta Pi Engineering Award (1968), and University of Kentucky Distinguished Honor Bandsmen. Mr. McDowell supported loans and scholarships in Engineering as early as 1965 and, as a former Drum Major of the UK Band, he funded three scholarships annually for members of the UK marching band. It was through Mr. McDowell’s generosity that the College of Engineering was able to establish the Terrell-McDowell Chair in Construction Engineering and Management. Construction is a very important part of Kentucky‘s economy and this funding enabled the College to establish an instructional program to prepare students for careers in the construction industry, to conduct research on construction problems, and to provide professional development programs for those already in the field. Mr. McDowell died October 30, 1987. His wife, Gloria, passed away in 2017.